Amid the red desert of northwest Africa is located the almond capital of Morocco - Tafraout. This picturesque town is situated in the south, a distance of 152 km. southeast of the city of Agadir and 92 km. from Ait-Baha. 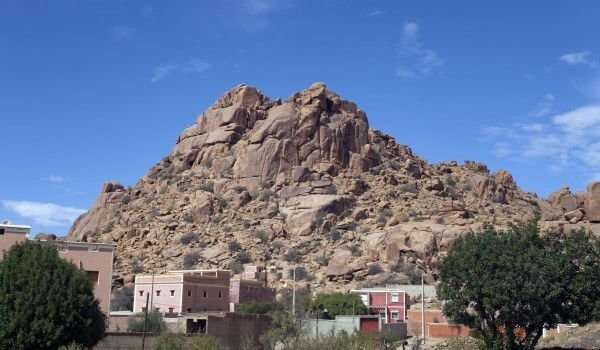 Summer here is unbearably hot, but in winter, spring or autumn Tafraout is a charming place for many tourists from around the world. The area around the city has some special geographical features. Here is a paradise for lovers of rock climbing, because over Tafraout are the attractive Anti Atlas mountains, which are known for their highly-jerky and uneven rocky shapes. Roads to the city are quite extreme - full of curves, narrow and uncomfortable, but once you get to this Moroccan edema, you'll find that was worth the effort. In early spring is held a yearly celebration of blossoming almond trees. Their flowers with bright green palm trees contrast with the pink color of the surrounding rocks and beige color of most buildings in the city. During the carnival of olive trees, the central square, called the twist is filled with many dancers and music, which gives the town of great charm and life. There are three things that are mandatory for tourists in Tafraout. One of them are palm groves around the town in the southeast direction. To reach them must pass through Anti Atlas striated rocks, and then come spectacular views of the valley Amelia. To enjoy properly the palm groves you need more than 24 hours. Another attraction is Blueridge of the Belgian artist Jean Vera. He and a group of Moroccan firemen in 1984 created on the steep cliffs one of the most peculiar works of art in the world. To add contrast, Vera used on the lower parts of the mountain 18 tons of blue, red, purple and white paint. Blue these rocks are particularly attractive in the general background of rose-red cliffs. Tafraout is famous for its prehistoric rock paintings. Only 2 km. from the provincial town in the south are unique engravings of gazelles, which date from the earliest period of human history.